Neovascular age-related macular degeneration (AMD) is the leading cause of vision loss and blindness in patients older than 60 years in the United States. Before the advent of anti-VEGF agents, the natural history of neovascular AMD was a rapid decline in vision with a resultant disciform scar and poor central vision. The phase 3 MARINA and ANCHOR trials showed not only that intravitreal administration of ranibizumab (Lucentis, Genentech) could maintain visual acuity in patients with wet AMD, but also that treatment often led to improvement in vision, with a mean increase of 6 to 11 letters.1,2 Subsequently, the VIEW 1 and 2 studies established the noninferiority of intravitreal aflibercept (Eylea, Regeneron) to ranibizumab in the treatment of neovascular AMD.3 Finally, the CATT and IVAN studies4,5 established that bevacizumab (Avastin, Genentech) and ranibizumab had similar levels of efficacy when used as monthly intravitreal injections. Despite the excellent efficacy of anti-VEGF agents in many patients with neovascular AMD, some patients do not respond completely or continue to progress and lose vision over time despite maximal anti-VEGF therapy. There is an ongoing effort to identify personal characteristics that may elucidate, influence, or predict one’s response to anti-VEGF therapy. In an attempt to better understand these differences in response to anti-VEGF therapy, the focus of current study has turned to an evaluation of the vitreomacular interface. Higher rates of vitreomacular adhesion (VMA) and lower rates of posterior vitreous detachment (PVD) are found in eyes with neovascular AMD compared with either healthy eyes or those with dry AMD.7-9 What is not known is whether VMA influences the development of wet AMD or whether wet AMD promotes VMA. The EXCITE trial included a subgroup analysis10 of 251 patients in which the influence of the vitreomacular interface on wet AMD treatment was investigated. Based on findings from time-domain optical coherence tomography (TD-OCT), patients were divided into three groups: those with PVD, those with release of vitreomacular contact, and those with VMA. The study found that in patients with a PVD, there was no significant difference in visual acuity in patients treated monthly or quarterly. Conversely, in patients with release of vitreomacular contact or with VMA, quarterly treatment resulted in significantly inferior visual acuity gains compared with monthly treatment. The study concluded that patients with VMA might need more intensive treatment to achieve similar visual acuity results. We performed a study11 to determine the influence of the vitreomacular interface on treatment outcomes in patients with neovascular AMD treated with anti-VEGF agents using a TAE protocol. This was a retrospective, consecutive case series of 204 eyes of 181 patients with new-onset neovascular AMD. Patients were divided into two groups based on spectral-domain optical coherence tomography findings: those with no VMA (non-VMA) and those with VMA. Mean age in the non-VMA group was 81.9 and in the VMA group 75.3. In the non-VMA group, mean pre-treatment visual acuity was 20/133 and mean central retinal thickness (CRT) was 350.5 μm; in the VMA group, the numbers were 20/145 and 371.8 μm, respectively. Use of bevacizumab, ranibizumab, and aflibercept was similar between the groups. Visual acuity in both groups improved significantly from baseline at years 1 and 2. The non-VMA group improved to 20/83 at year 1 and 20/64 at year 2, while the VMA group improved to 20/81 at year 1 and stabilized at 20/85 at year 2. In each group, approximately 22% of patients gained 3 or more lines of vision at years 1 and 2. Additionally, more than 90% of patients in each group avoided loss of 3 or more lines of vision. CRT decreased in conjunction with improving visual acuity. In the non-VMA group, CRT decreased to 289 μm at year 1 and 267 μm at year 2. In the VMA group, CRT decreased to 305 μm at year 1 and 289 μm at year 2. The VMA group showed an increased percentage of persistent choroidal neovascular activity in comparison with the non-VMA group (63% at year 2 compared with 54%, respectively). Finally, mean numbers of injections at years 1 and 2 were significantly different. Patients in the non-VMA group needed 7.37 injections in year 1 on average, while patients in the VMA group required 8.35 injections. At year 2, patients in the non-VMA group required a mean 5.52 injections compared with 6.67 injections in the VMA group. The mean longest interval extension was also significantly longer for the non-VMA group (11.81 weeks at 1 year and 14.08 weeks at 2 years) compared with the VMA group (10.08 and 11.89, respectively). The clinic utility of treating VMA associated with neovascular AMD was recently explored by Novack and coworkers12 as they investigated the use of intravitreal ocriplasmin (Jetrea, ThromboGenics) in combination with anti-VEGF agents. Their randomized, prospective phase 2 trial enrolled 100 patients with VMA and wet AMD to compare combination therapy (ocriplasmin plus anti-VEGF) versus sham (anti-VEGF alone). At 1 year, safety profiles were similar to those of previous ocriplasmin trials, and the group treated with ocriplasmin had higher rates of VMA release (41.9% versus 24%) and total PVD (23% versus 12%) compared with the sham-treated group. Of note, the combination group required 28% fewer injections (4.4 versus 6.1) compared with the sham group. With improved imaging technology, we are learning more about the vitreoretinal interface and its effect on numerous retinal diseases. There is much debate regarding whether VMA is pathologic in nature or whether it represents only a stage in the development of a PVD. The vitreous and vitreomacular interface may also act as a diffusion barrier. Vitrectomy and PVD result in a more liquefied vitreous with decreased viscosity, leading to increased diffusion of oxygen, cytokines, growth factors, and medications. The vitreomacular interface, notably VMA or vitreomacular traction, may act as a barrier to the diffusion of small anti-VEGF molecules across the densely arranged collagen matrix of the posterior hyaloid and cortical vitreous into the retina. VMA may also confine proangiogenic molecules in the retina by preventing their diffusion into the vitreous cavity. Our current study suggests that anatomic factors may contribute to individual treatment responses and should be considered in treatment decisions for neovascular AMD. Although eyes with neovascular AMD had similar visual acuity outcomes regardless of the configuration of the vitreomacular interface, eyes with VMA may require more frequent and intensive anti-VEGF treatment and have a decreased ability to extend the interval between injections (Figures 1 and 2). Allen C. Ho, MD, is the director of retina research at Wills Eye Hospital and a professor of ophthalmology at Thomas Jefferson University in Philadelphia, Pennsylvania. Dr. Ho may be reached at acho@att.net. S. K. Steven Houston III, MD, is a second-year vitreoretinal fellow at Wills Eye Hospital in Philadelphia, Pennsylvania. Dr. Houston may be reached at shouston3@gmail.com. Nadim Rayess, MD, is a retina research fellow at Wills Eye Hospital in Philadelphia, Pennsylvania. Dr. Rayess may be reached at nmrayess@gmail.com. Carl D. Regillo, MD, is the director of the Retina Service of Wills Eye Hospital and a professor of ophthalmology at Thomas Jefferson University in Philadelphia, Pennsylvania. Dr. Regillo may be reached at cregillo@aol.com. Rosenfeld PJ, Brown DM, Heier JS, et al; MARINA Study Group. Ranibizumab for neovascular age-related macular degeneration. N Eng J Med. 2006;355(14):1419-1431. Brown DM, Kaiser PK, Michels M, et al; ANCHOR Study Group. Ranibizumab versus verteporfin for neovascular age-related macular degeneration. N Eng J Med. 2006;355(14):1432-1444. Heier JS, Brown DM, Chong V, et al; VIEW 1 and VIEW 2 Study Groups. Intravitreal aflibercept (VEGF Trap-eye) in wet age-related macular degeneration. Ophthalmology. 2012;119(12):2537-2548. Martin DF, Maguire MG, Ying GS, et al; CATT Research Group. Ranibizumab and bevacizumab for neovascular age-related macular degeneration. N Eng J Med. 2011;364(20):1897-1908. Chakravarthy U, Harding SP, Rogers CA, et al; IVAN Study Investigators. Ranibizumab versus bevacizumab to treat neovascular age-related macular degeneration: one-year findings from the IVAN randomized trial. Ophthalmology. 2012;119(7):1399-1411. Berg K, Pedersen TR, Sandvik L, Bragadottir R. Comparison of ranibizumab and bevacizumab for neovascular age-related macular degeneration according to LUCAS treat-and-extend protocol. Ophthalmology. 2015;122(1):146-152. Krebs I, Brannath W, Glittenberg C, et al. Posterior vitreomacular adhesion: a potential risk factor for exudative age-related macular degeneration? Ophthalmology. 2007;144(5):741-746. Robison CD, Krebs I, Binder S, et al. Vitreomacular adhesion in active and end-stage age-related macular degeneration. Am J Ophthalmol. 2009;148(1):79-82. Mojano F, Cheng L, Bartsch DU, et al. The role of abnormal vitreomacular adhesion in age-related macular degeneration: spectral optical coherence tomography and surgical results. Am J Ophthalmol. 2008;146(2):218-227. Mayr-Sponer U, Waldstein SM, Kundi M, et al. Influence of the vitreomacular interface on outcomes of ranibizumab therapy in neovascular age-related macular degeneration. Ophthalmology. 2013;120(12):2620-2629. Houston SK III. Influence of vitreomacular interface on anti-VEGF therapy using treat and extend treatment protocol for age-related macular degeneration (VINTREX). Paper presented at: American Society of Retina Specialists annual meeting; August 9-13, 2014; San Diego, CA. 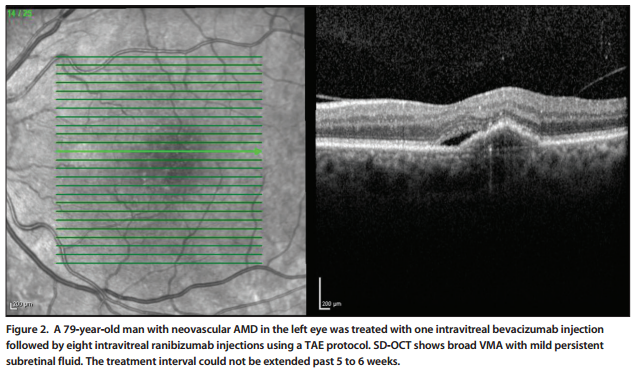 Novack RL, Staurenghi G, Girach A, Narendran N, Tolentino M. Safety of intravitreal ocriplasmin for focal vitreomacular adhesion in patients with exudative age-related macular degeneration [published online ahead of print November 27, 2014]. Ophthalmology. doi:10.1016/j.ophtha.2014.10.006. Donoso LA, Kim D, Frost A, Callahan A, Hageman G. The role of inflammation in the pathogenesis of agerelated macular degeneration. Surv Ophthalmol. 2006;51(2):137-152. Seko Y, Seko Y, Fujikura H, Pang J, Tokoro T, Shimokawa H. Induction of vascular endothelial growth factor after application of mechanical stress to retinal pigment epithelium of the rat in vitro. Invest Ophthalmol Vis Sci. 1999;40(13):3287-3291.